NEW YORK—When voters head to the polls on Sept. 10, it may be like stepping back in time for some. Despite being in the second tech capital of the United States, the city will likely have voters cast their ballots using lever machines. State legislators are expected to vote before the session ends this week to bring back the archaic machines, originally invented in the late 1800s, for the primaries and any runoffs, although the new optical machines would be used for the general election. The bill would also extend the time between a runoff to three weeks from the current two. 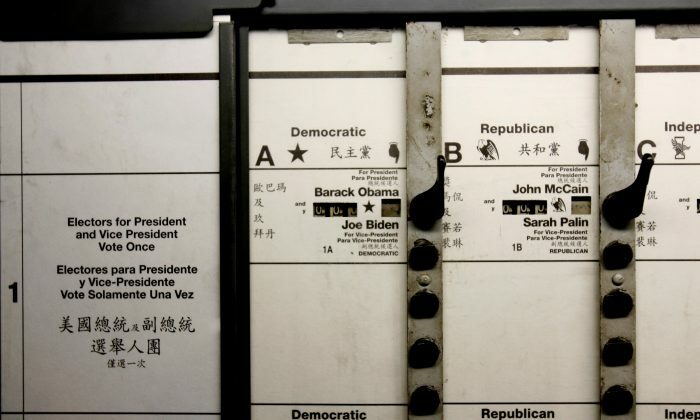 Bringing back the machines could prove troublesome in Queens, the only borough with five languages—English, Spanish, Chinese, Korean, Bengali—required to be on the ballot. Bengali was added as a required language in 2010, after optical machines were already in use. Chinese- and Korean-speaking voters were already having trouble reading the tiny characters during the last election with the lever machines according to Glenn Magpantay, directory of Democracy Program for the Asian American Legal Defense and Education Fund. “Lever machines cannot be used unless they accommodate the languages,” Magpantay said. He said his organization is exploring all legal options to ensure no language-based discrimination this election season. Voters have the option to use ballot-marking devices if they cannot read the ballot, or cannot access the lever machines, but the law requires all languages must be on the ballot. The paper ballots are counted separately, which could potentially reveal a certain demographic when the votes are tallied. Lawrence Norden, deputy director of Brennan Center for Justice, said lawsuits from multiple groups are possible, but the Legislature would not have the final say. Under current voting rights, laws of this type from New York City must be approved by the Department of Justice (DOJ). Advocacy groups will likely appeal to the DOJ before heading to court to block the lever machines from coming back. The lever machines do have some support, including from Mayor Michael Bloomberg. Norden said supporters often forget how often the machines, with their 28,000 moving parts, often broke down. “I hope the board is taking the steps it needs to take to ensure there are people still trained in how to repair them, and they have all the extra parts they need,” Norden said. He also noted in the three years since lever machines were taken out of use, a lot of education had been done to teach voters. Norden said money will have to be spent on educating the public to use lever machines. The Epoch Times reached out the New York City Board of Elections to ask how they planned to deal with these issues. Phone calls and emails were not returned by press time.